Team Cockroft & Walton in our summer 2018 Accelerator Fundamentals class makes a breakthrough in measuring the characteristics of a Wall Current Monitor. Veksler & MacMillan teammates in the January 2018 Accelerator Fundamentals class investigate the inner structure of a 'pillbox cavity' during the RF cavities lab. Fundamentals students determine the characteristics of a wall current monitor/toroid and a beam position monitor as part of a laboratory session on instrumentation. 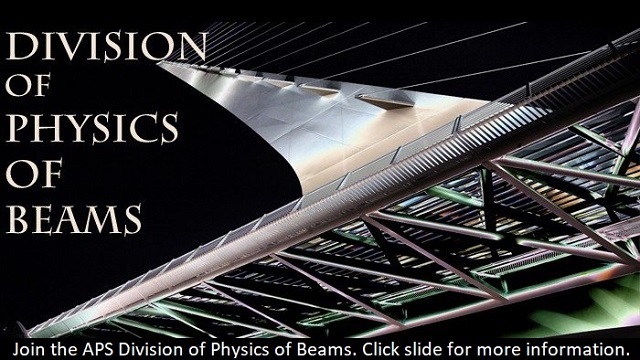 Join the APS Division of Physics of Beams. Click slide for more information. Click slide for more information and a list of past prize recipients.